On Sunday 24 March Omagh Methodist Church hosted the North West Local Preachers final service. With the eight current Districts in Ireland due to reduce to three in July the Local Preachers in the North West District wished to celebrate their service as preachers before the District boundaries changed. The Service was led by John Buchanan and Aylmer McKinney with 16 other preachers participating through readings, prayers and musical items. Mrs. Deanna Balmer from Ballymoney and the current Local Preachers Secretary gave the address based on Psalm 23 “The Lord is my Shepherd”. Mrs. Balmer is now retiring from her role having given 16 years of dedicated service. 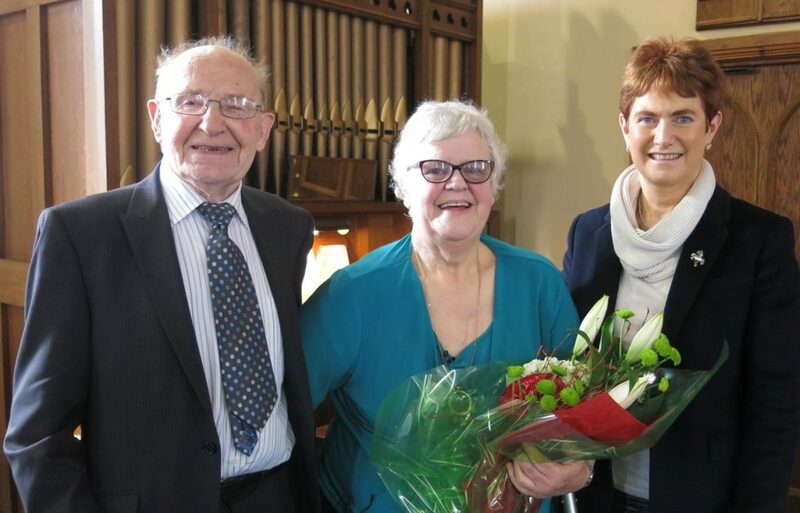 In recognition of her service Mr Balmer was presented with gifts by Mrs Ann Scott and Mr. Hamilton Blain from Londonderry, one of the District’s senior local preachers. A delicious lunch was served by the ladies of the Omagh Society for all local preachers and their spouses present.